Zero Rust® is a high solids phenolic-modified alkyd coating which controls rust and corrosion by putting down an impermeable barrier at the steel level. Zero Rust® provides maximum adhesion to steel, starving the surface of oxygen stopping the process which converts steel to rust. Zero Rust® is free from lead and isocyanates and is easy to apply over fully or marginally prepared surfaces. Zero Rust® is a single package air dry coating which exceeds 2000 hours in the ASTM-B117 salt spray test. Zero Rust® is designed for use on new and old steel, rusty surfaces and partially rusted and partially painted surfaces such as metal pipes, tanks railing and equipment. This product is not recommended for submersion applications. Refer to the Zero Rust Application Instructions or Product Brochure for preparation, cleaning and application instructions. Zero Rust® Retailers can find additional product information on the Safety Data Sheets (SDS). 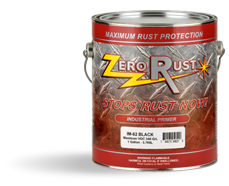 Zero Rust® is available in 10 popular colors and four sizes including quart, gallon, 5 gallon pail and 12 oz aerosol can. Zero Rust® as supplied has a V.O.C. of 340 grams/liter.